His third – and 14th league goal of the season – was controversial as the ball struck his arm as he slid in to meet Sterling’s cross but it was not intentional and the goal was allowed to stand. It was a fine response by Pep Guardiola’s side after their surprise 2-1 defeat at lowly Newcastle last Tuesday. 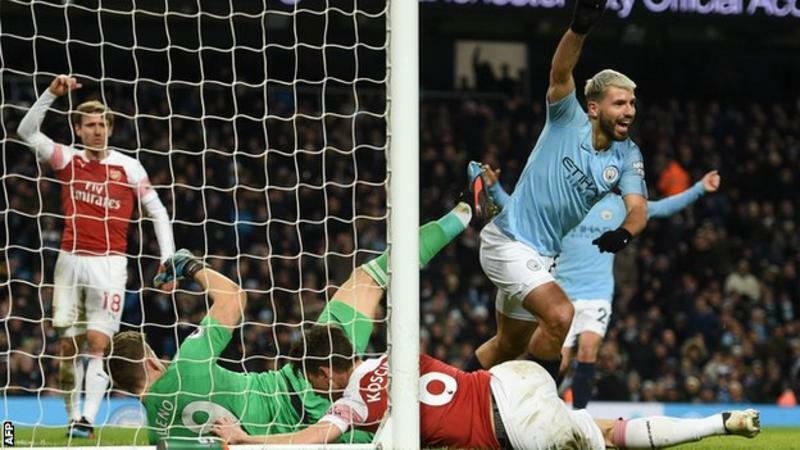 The City manager had urged his side to beat Arsenal in style to keep the pressure on Liverpool – and his players responded at Etihad Stadium. Leaders Liverpool will restore a five-point cushion at the top if they win at West Ham United on Monday (20:00 GMT). Arsenal, who started the weekend fourth in the table, finish it down in sixth after being overtaken by Chelsea and Manchester United. The Gunners are without an away win in the top-flight since 25 November.